I must admit to feeling a little apprehensive as I sat in the lounge bar of the Rosedale Hotel, Portree, and, with a friend, planned my first day out in the Black Cuillin of Skye. The guide book opened on the pub table before us threatened difficult scrambles and sheer drops but, after a few pints, all fears were banished and we decided to set off the following morning for Sgurr Alasdair, the highest peak on the island. An easy scramble, according to the book, it looked challenging enough for two Cuillin novices. The route starts from Glen Brittle Hut, about a mile inland from the head of Loch Brittle where there is a rather windswept little campsite served by a well-stocked shop. The path sets off over open moorland and navigates a peaty landscape up to Loch an Fhir-bhallaich. Keep an eye out to the left for some attractive little waterfalls. The way is fairly well trod here and the climb up to the lochan high up in Coire Lagan is fairly easy going, although a bit rocky in places. In the best traditions of Skye, it began to rain almost as soon as we left the car and when we reached the little pool, the mist was right down and the visibility didn't extend much beyond the ends of our noses. As a result, we couldn't see the impressive flute of the Great Stone Shoot - our route to the summit - in all its majestic stoniness. We picked our way across the coire to its base and began to battle our way through the rubble gathered at the bottom. For an experienced walker, the shoot does not present a problem. The only thing to be wary of is parties higher up as you have to tread very carefully to avoid sending stones down. In mist, your only indication is to listen out for the clunking of the rocks (and the odd cry of pain as someone twists an ankle!). 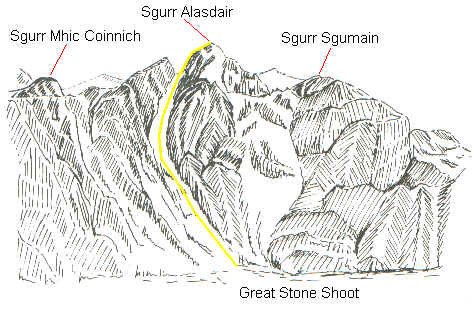 The stone shoot is the only access for the walker on to Sgurr Alasdair. The mountain is guarded by steep cliffs and scree ledges all round and other ascents involve very difficult rock climbs. As you make your way up the shoot, it narrows into a tight funnel guarded by large rocky slabs and if you are not used to this sort of thing, the climb becomes a bit more tricky towards the top. This is made worse by the fact that the stones thin out higher up, the result of hundreds of pairs of feet rising to the Great Stone Shoot challenge, and there are fewer large boulders to anchor things. One thought to bear in mind is that if you do start to slip back, face down the hill and go with the stones. Keep your footing and after a few feet you should come to a stop. Guidebooks recommend that you go easy on the shoot and move as delicately as possible when there are others below you and keep a look out for large dislodged stones. They also warn that in mist care should be taken not to veer out to the right on to the large area of scree to the south of the shoot. When you reach the top, the scree goes over the other side and appears to go down to Coire a'Ghrunnda. Look, but don't be tempted to go over here as it soon gives way to a precipice. As we arrived at this point, the mist had sadly failed to clear. Even with poor visibility, though, the ascent to the summit - 30 metres on - is a fairly easy scramble over rocks. After a brief pause for reflection in the fog, we began our descent by the same route. On a clear day, impressive panoramic views are promised on the top. Sgurr Alasdair (993m), translated as the Peak of Alexander, is named after Sheriff Alexander Nicolson who made the first ascent of the Great Stone Shoot in 1873. The top does not lie on the main Cuillin ridge, but on a spur extending from the Alasdair-Thearlaich col to Sgumain and Sron na Ciche. Going back down the shoot is most enjoyable when there is no one else on it. You can scree run down over the stones, right down to the lochan. With one Cuillin peak under our belts, we returned to the comfort of the hotel bar and began to plot out next adventure on the misty isle. Map OS Landranger sheet 32 or OS Outdoor Leisure 1:25,000 sheet 8 (The Cuillins & Torridon). Start/parking Glen Brittle Hut, or from the campsite. Guidebook Black Cuillin Ridge Scramblers' Guide by S.P. Bull (Scottish Mountaineering Trust) - the illustration above is taken from this book. Grading Winter in the Cuillin calls for full winter mountaineering skills and equipment. Even when free of snow, the hills are subject to ferocious winds which can be a major hazard. Mist is very common on Skye, throughout the year.